Miss you so much already Nick ‘Noola’ Newall. My many instrument talented tenor player and wise dignified friend of 60 yrs has passed into the ether last night. Never a cross word or wrong note passed his lips in all the time we spent together, in vans, cars, buses, planes and smelly band rooms in all the towns we played. The longest standing member of the Roll Band (Big or little) he always contributed more than his recompense. His class continues to show in that he requested no funeral so all I can do to indicate my respect is to recommend you listen to the countless impeccable solos he provided on my and many others’ recordings. Warm heartfelt memories of great intelligent humour to his dear Marilyn and their son that will no doubt carry them through this painful time. His quiet voice and laugh are with us still. 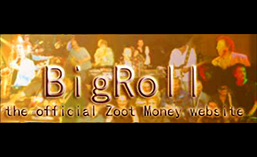 Get booking now, because Thursday 26th of October …yes THIS month… Big Roll will be rolling into the Bulls Head, Barnes. We will remember the late Nick Newall: replacing him on tenor will be the very able Nick Payne. A celebration of Nick N’s life will be announced later on Facebook for friends and musicians to pay respects. Meanwhile… see you on Oct 26th. Right? Posted in gigs, music friends, personal. loss of one of the human race’s most beautiful souls so she can rejoin her fellow angels . advice, help and always with absolute frightening honesty. Although hundreds had a truly valuable meeting or relationship with her either as Vera McCann, Vonnie, Veronica, Veron or even ‘Scots Ronni’, I was the luckiest of all and got to be her soul mate for an unbelievable life commitment of over 50 years. Although now alone, I not only have two sons, a daughter, two grandkids, a great grandchild and a further expected great grandchild to remind me of her positive attitude and beliefs…..
indeed instigated, that shall help spur me on with laughter and love in the future. Details of service will be posted on Facebook when fixed.